Tom Kuhnhackl was drafted by Pittsburgh in 2010 and much was expected of this top-ranked prospect. He was eighth overall among European skaters and is the son of International and German Sports Hall of Famer, Erich Kuhnhackl, who is touted as being the best German hockey player to ever touch the ice. Though his father never played in the NHL, E. Kuhnhackl did win four German Championships with their top-level team and an Olympic bronze medal in 1976. Those are mighty large shoes to fill but it seemed that Tom was up to the challenge. After spending time on both of the Pittsburgh Penguins minor league affiliate teams (the Wilkes Barre/ Scranton Penguins and Wheeling Nailers), T. Kuhnhackl made his NHL debut Jan. 9th, 2016 in Montreal against the Canadians. However, he would not score his first goal until 2/20 against the Tampa Bay Lightning. 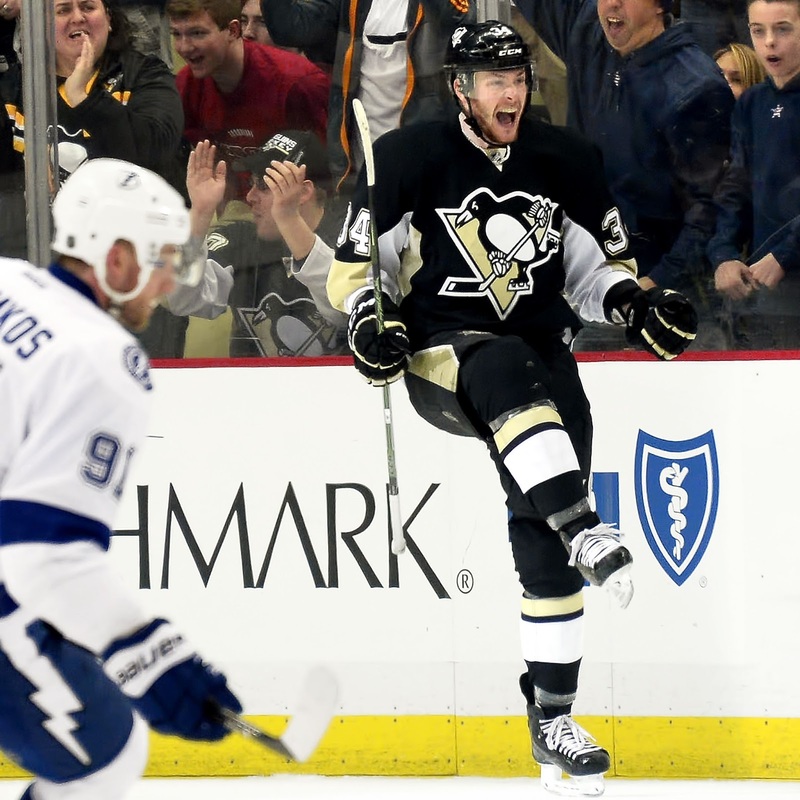 Kuhnhackl was an integral part of the Pittsburgh Penguins Stanley Cup success last season. He performed well in his role on the fourth line and excelled on the penalty kill notching three total short-handed goals in the process (two in the regular season, one in the post season). He would end the 2015-16 campaign with five goals, ten assists for 15 points. That would be the go-ahead goal to give the Penguins a victory over the Capitals in late March when every point mattered heading into the final weeks of the regular season. Performance expectation grew even higher as the Penguins opened their season on 10/13 versus Washington. Against a formidable and familiar foe, the energy began to run heavy early in a game that would ultimately end in a Penguins shootout victory. One of the more interesting stories of the night involved Kuhnhackl. Kuhnhackl is the definition of a grinder. He can battle hard along the boards to keep possession going, screen a goalie with his 6'2 frame to create a scoring opportunity, and shows no fear when it comes to blocking a shot. 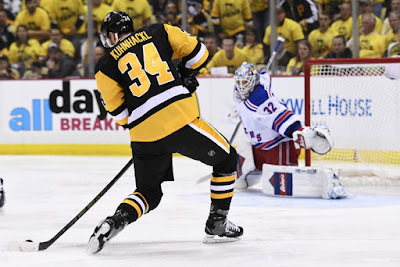 Most recently, respected and popular Pittsburgh sports columnist, Josh Yohe (of DKPittsburghSports.com), tweeted out that Kuhnhackl "...shows no regard for his life" as he continued to block shot after booming shot against the Nashville Predators on 10/18. When the Florida Panthers and future Hall of Famer, Jaromir Jagr, came to town on 10/25, Kuhnhackl made a brilliant play, a centering feed to Eric Fehr, that would see Fehr score and put the Pens up 3-2 in the eventual win. With veteran Matt Cullen (whom Kuhnhackl lovingly nick named "Team Dad") as his mentor helping to guide him, the sky is the limit for this young winger. In fact, he could grow into the kind of player that is a key component to a Cup championship. He won't be your star, but rare it is to see other players in his position outwork him on the ice (except for maybe the aforementioned Matt Cullen). On paper, everything seems to be going Kuhnhackl's way. In reality, he has only seen an average of eight minutes, 41 seconds of ice time over nine games. He has only six shots at the net and no goals to show for his efforts. When the team headed out west to play the clubs in California, Tom Kuhnhackl was a healthy scratch for all three games. He was replaced by Tom Sestito versus the Anaheim Ducks and the LA Kings. Upon the return of Conor Sheary back from injury, Kuhnhackl again sat in the press box against the San Jose Sharks. An interesting sentiment to be sure especially when you take into account that, productivity wise, Kuhnhackl has six shots on net to Sestito's two. Sestitio also has seven times the penalty minutes. All things being considered, and assuming there is no unmentioned injury, why is Kuhnhackl sitting in time out? It makes sense to give Conor Sheary the nod for a game as he is coming back from injury and wanting to get him back into the swing of game play, but even I have a hard time wrapping my brain around Sestito taking the spot on the fourth line. Granted, Sestito has been playing better then in previous years and even got an assist on the Matt Cullen goal against Anaheim on 11/2, but Kuhnhackl had two assists prior to that night. Although the Penguins returned home with a 3-1 record on their first extended set of road games (that began in Philadelphia), one must ask this; would the outcome have been any different with Kuhnhackl in the line up or was the need for a grittier, "Enforcer"-type player greater than one known for his defensive style of play? The answer, at this point, is a blur. Everyone seems to be scratching their heads, myself included. It seems that Tom Kuhnhackl is the odd man out for the time being as Sesitio has been reassigned to Wilkes Barre and Conor Sheary likely to stay in the line up after making a splash his first game back. Kuhnhackl may have to wait for either an injured or another "under-productive" player to replace in order to return to play and only time (or HC Sullivan) will tell when that occurs.